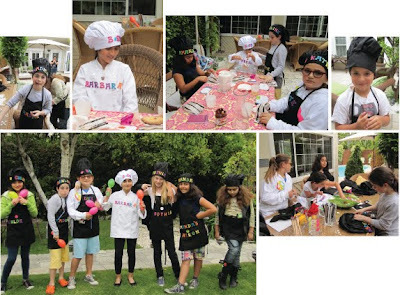 Barbara asked for a Baking party, so my friend Chantal, the owner of New Chef Fashion, created kids sized aprons and baking hats that the 8 girls had to customize with paper flowers and confetti letters. With Alexia, my oldest daughter, we taught them how to bake M&Ms cookies and how to cook crepes.We had such a blast ,especially me. I am already brainstorming ideas for next year's cooking party !